In an unsurprising turn of events, Uncharted 4: A Thief’s End will be the latest title to receive a limited edition PS4. Sony have been pulling out all the stops as of late with custom PS4 designs and it’s no surprise to see their flagship franchise getting the same treatment. The bundle will include a 1TB “Gray Blue” PlayStation 4 with a silk-screened image of Nathan Drake on the console. 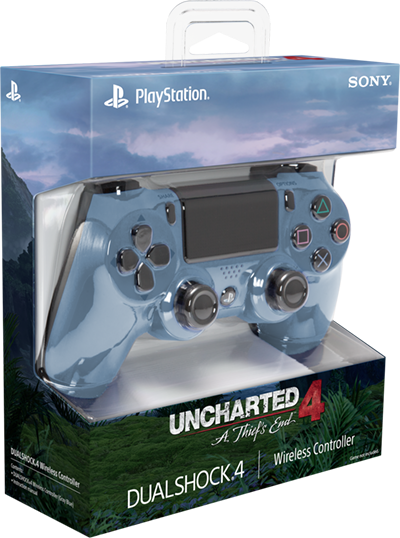 A matching “Gray Blue” controller and a physical copy of Uncharted 4 will also be included in the box. The Latin phrase “Sic Parvis Magna” is printed on the front of the console, this translates to “Greatness from small beginnings”. Longtime fans will note this is the same phrase engraved on Nathan Drakes ring. Players who love the colour should worry not as the “Gray Blue” controller will be available for purchase separately. This will be available in early April. 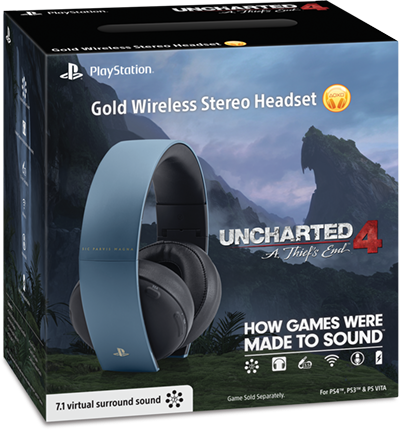 A “Gray Blue” variant of the “Gold Wireless Stereo Headset” will also be made available. You can take a look at both below. This is certainly a boon for current PS4 owners as they will not be left out. The console will release alongside Uncharted 4 on the 27th of April in the EU and the 29th in the UK and Ireland. Sony have stated that pre-orders for the limited edition bundle will be available shortly, so keep your eyes peeled!